2013 was the year of Emerald everywhere and in 2012, the color was Tangerine. Now Pantone officially announced Radiant Orchid as the color of the year for 2014. 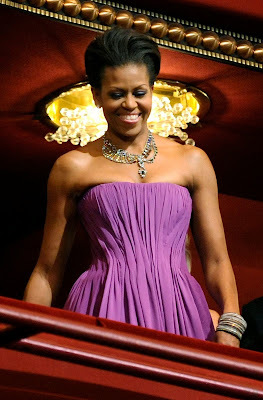 Stars like Amy Adams, Coco Rocha, Olivia Palermo and Selena Gomez having been rocking the color on the red carpet but no one does it like Michelle Obama. We all know the first lady loves wearing purple but I can't help to think her choice of color could of influenced Pantone's decision. Radiant Orchid is a refreshing color for 2014 because of it's toned down hue which makes it the perfect finishing touch going into the holiday season and new year.